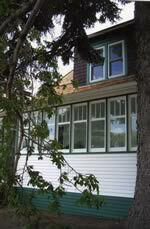 During the second half of the year 2004, the Gustin/Trounce Heritage Committee Inc. devoted much time to consultation with the City of Saskatoon (as Gustin House is a municipal heritage property), with architects and interior design personnel, and with various other partners to plan the restoration. The City's Municipal Heritage Advisory Committee toured the premises and gave both approval and encouragement for the project. Early in the fall of 2004, the senior drafting class of Bedford Road Collegiate, under the supervision of their teacher, Renee Duddridge, measured Gustin House and drew floor plans as a team effort . . the project was beginning! 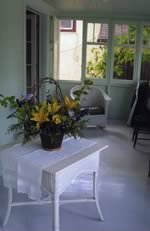 Interior work commenced on January 3, 2005, under the supervision of Ms. Duddridge (Duddridge Interior Design), along with hands-on assistance from Committee members. The exterior and structural plans, for both historic restoration and the addition of an access ramp to the rear of the House, were designed by Allan Duddridge, principal architect, Stantec Architecture Ltd. He, along with Bob Trumbley and Robin Gach, also Stantec architects, carried out the project with the general contractor, D2 Construction. Gustin House exterior restoration began in later February, 2005; members of the Committee continued to be closely involved in the process. 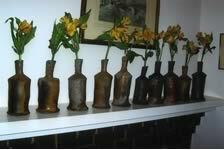 Gustin House was ready for visitors on May 31, 2005, the 110th anniversary of Lyell Gustin's birth. Following are photos taken by Michael Pomedli, March 31 through May 31, 2005. 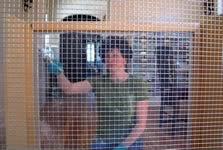 Karen Sterner paints newly-made radiator housing. 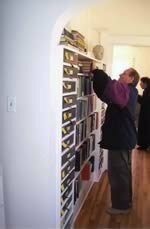 Gregory Schulte arranges books he has just returned from storage. 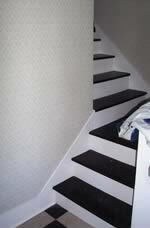 The freshly-painted stairs in the entrance hallway. Committee members Joan Halmo, Gregory Schulte, Lynda Finnimore and Walter Thiessen--all Gustin students--consider the next step. 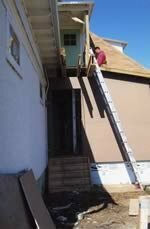 Construction at the rear of Gustin House: work on the porch and roof. Gustin House from 10th Street, ready for the opening on May 31. 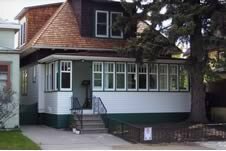 Gustin House, 512-10th Street East, was formally inaugurated on Tuesday, May 31, 2005 by Her Honour the Honourable Dr. Lynda Haverstock, Lieutenant Governor of Saskatchewan. 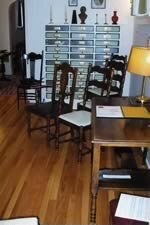 Dignitaries and guests representing musical, cultural, and heritage groups attended a ceremony and recital at the newly-restored studio and home of Lyell Gustin. Councillor Elaine Hnatyshyn brought greetings from the City of Saskatoon, and President Peter MacKinnon, from the University of Saskatchewan. Dr. Haverstock, lauding the far-reaching lifetime contribution of Lyell Gustin, declared the House officially open as a centre dedicated to the Gustin legacy. The inaugural recital included a piano solo performance, vocal music, and--in the long tradition of the Lyell Gustin Piano Studios--a symphonic work arranged for two pianos, eight hands. The printed program and photos appear below. 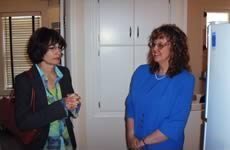 Her Honour, the Honourable Dr. Lynda Haverstock, Lieutenant Governor of Saskatchewan, is met at Gustin House by Walter Thiessen, president of the Gustin/Trounce Heritage Committee Inc. 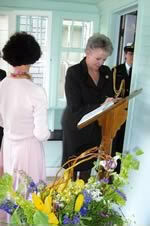 Her Honour signs the guest book while the Honorary Aide-de_camp Lt. (N) Karen Wallace and Karen Sterner look on. Committee members and guest speakers assemble in the back studio: left to right, Peggy Sarjeant, Elaine Hnatyshyn, Peter MacKinnon, Gregory Schulte. Boyd MacDonald visits with other Gustin students: left to right, Mary Barrett and Mary Friesen. Performing Symphony No.2 by Brahms are, left to right: Sheila Shinkewski, Karen Sterner, Gregory Schulte and Walter Thiessen. Following the formal opening ceremony, Her Honour awarded the Lieutenant Governor¹s "Celebration of the Arts" pins to members of the Gustin/Trounce Heritage Committee Inc.: Lynn Ewing, Lynda Finnimore, Joan Halmo, Peggy Sarjeant, Gregory Schulte, Karen Sterner and Walter Thiessen. This Committee of volunteers was responsible for directing the restoration of Gustin House and for organizing the inauguration, the opening recital and summer events. A reception concluded the afternoon event. 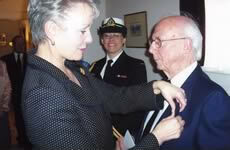 Her Honour awarding the "Celebration of the Arts" pin to Walter Thiessen. 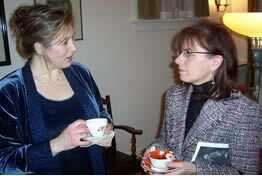 Lynn Ewing takes tea after the inaugural recital, in which she performed. 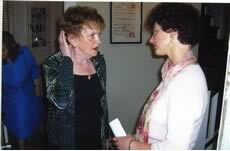 Margaret Kippen, a Gustin graduate with Peggy Sarjeant. 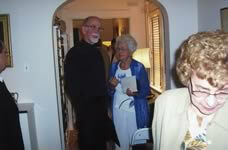 Allan Duddridge, architect, and Renee Duddridge, interior designer with Joan Halmo. In the foreground, Gregory Schulte converses with Bob Trumbley, architect; in the background, left to right, Peggy Sarejeant, Allan Bailey with Colleen Bailey, chair of the Saskatchewan Arts Board, and Bernie Flaman, Provincial Heritage Architect. Barb Sprigings, Heritage Conservation Coordinator for the City of Saskatoon with Lynda Finnimore. Sheila Shinkewski and Karen Sterner recall their days at Mr. Gustin's studio. 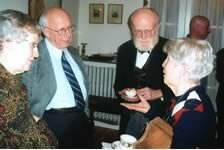 Friends and former students of Lyell Gustin took the opportunity to visit Gustin House on May 31 between 6:30 and 7:30 p.m., the first of several scheduled "visiting times" which will take place in 2005. At times, there were line-ups at the front door as guests signed in and took time to renew acquaintances in the familiar verandah. Visitors came from numerous out-of-town points, including Vancouver, Victoria, and Powell River, BC; Calgary, Edmonton and Manyberries, AB; Winnipeg; Brantford and Waterloo, Ontario; and numerous centres in Saskatchewan including Regina, Prince Albert, North Battleford, Yorkton, Biggar, Kindersley, Meadow Lake, Bruno, Shellbrook, Riverhurst, Cut Knife, Langham, and Kenaston. 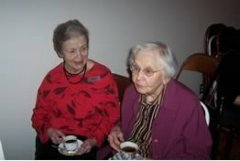 The very first arrival announced herself as a Gustin student of the 1930s: now 90 years old, she had heard the CBC's Jennifer Robinson interview Gregory Schulte on "Afternoon Edition" on May 30; she was able to attend the opening events thanks to a niece who brought her to Saskatoon from Shellbrook. Though vision-impaired, she took her place at the grand piano and played "Waltz in A-flat" by Johannes Brahms! "I used to come here by train from Kenaston when I was a young girl," she said. 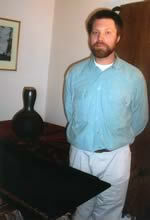 "It is a highlight in my life to come back to the studio of my wonderful teacher, Lyell Gustin." 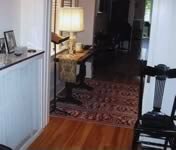 The photos below show the restored interior which visitors saw, and the evening's first guest, Esther (Hoffman) Lundy, at the grand in Gustin House. Gustin House on May 31, northwest view from 10th Street. 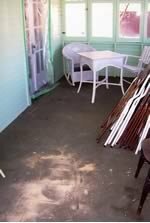 Gustin House verandah, May 31, 2005. 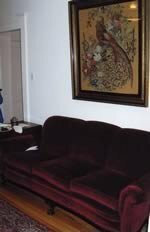 The sitting room with newly-repaired sofa. The view from the back studio. Mr. Gustin's desk in the studio and his shelving for musical scores. 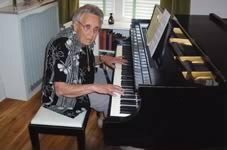 Ninety-year old Gustin graduate, Esther (Hoffman) Lundy of Shellbrook plays Brahms on her first return to the studio in many decades. On Tuesday, May 31, the 110th anniversary of the birth of Lyell Gustin, Boyd McDonald of Waterloo, Ontario, performed a public recital in honour of Mr. Gustin who was his teacher for 10 years. 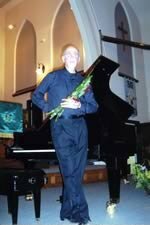 The evening event at Grace-Westminster United Church featured piano music of the Romantic era and was well-attended by a warmly appreciative audience. Boyd also played one of his own compositions. The Committee is deeply grateful to Boyd for returning home to perform--his Beethoven work was the first music heard in the newly-opened Gustin House during the afternoon ceremony; and his public recital in the evening celebrated both the 110th anniversary of Lyell Gustin¹s birth and the inauguration of "512." The printed program and photos follow. 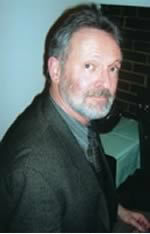 At the evening recital on May 31, Boyd MacDonald receives yet another curtain call. 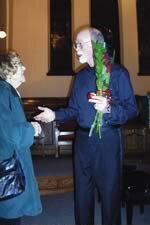 Saskatoon's Martha Blum chats with Boyd MacDonald after the recital. A season of wonderful music! 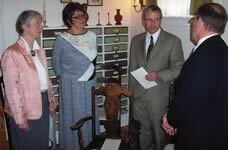 During July and August 2005, Gustin House held a series of festive musical events to celebrate Lyell Gustin and to mark the opening of Gustin House during the year of Saskatchewan¹s Centennial. 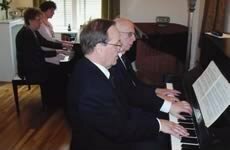 Three public recitals featured several Saskatchewan-born artists who had studied with Lyell Gustin; a homecoming dinner was held at the Bessborough, and many visitors came to the newly-restored Gustin House. The Committee is delighted at the success of these events and is deeply grateful to all the performing artists whose generosity made the summer series honouring Dr. Gustin possible. Thank you also to the many who assisted with events in so many ways. Below is the summer poster; programs for the recitals are included under other headlines. During the informal visiting times at Gustin House on July 24 and 31, and August 7 many former students of Lyell Gustin stopped in, as did members of the general public. On each of these occasions, young artists and emerging professionals performed, recalling the many recitals held here in years past: Thank you to Jonathan Lee, pianist, July 24; to Sarah Vardy, soprano, with Mark Turner, pianist, July 31; and Mark Turner, pianist, August 7, for their fine performances. 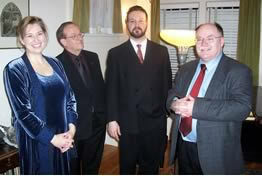 An evening program in mid-November 2005 began anew the tradition of small-scale musical and cultural events in Gustin House. 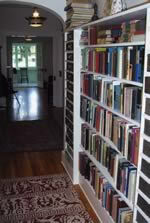 Lyell Gustin had founded his studio environment upon his conviction of the unity of the fine arts and the belief that knowledge of one art enhances understanding of the others; in that spirit, he arranged many events to bring together performers, artists, and scholars of literature and philosophy. In keeping with this ideal, the first program of "Celebrating the Fine Arts" was held at Gustin House on Sunday, November 13, exploring textures of the artistic medium through pottery, poetry, and music for flute. Martin Tagseth, potter, who has studied, taught and exhibited works internationally, brought a wonderful array of pieces from his studio in Lake Lenore, Saskatchewan, and reflected on the experience of "Creating in Clay." Dr. Raymond Stephanson, Professor of English at the University of Saskatchewan and a Gustin Studios graduate, read poetry and spoke on its rich associations with music. Performances were by Saskatoon musicians, flautists Ross Carstairs and Brenda Moats, with pianist Gregory Schulte: the haunting "Syrinx" by Debussy, a Trio by Quantz and a flute duo by Pleyel captivated listeners. In the audience were numerous Gustin graduates and friends of the Studios, some of whom--along with the artists and speakers--are shown below (photos by Michael Pomedli). Brenda Moats, Ross Carstairs and Gregory Schulte. Tagseth's works displayed at Gustin House. 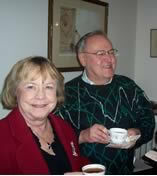 Joan Halmo and Allen David. 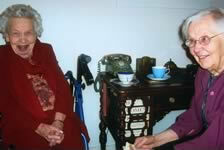 Margaret Kippen and Louise Schulte. Lisa Hornung, Gregory Schulte, Michael Harris and Walter Deller in the back studio. John Botari and Michael Harris. 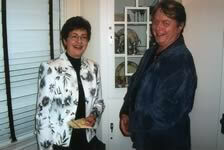 June and Doug Barber, visitors from Hamilton. 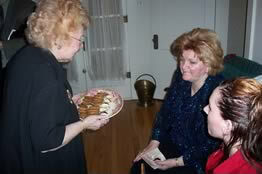 Jeanne Walter serves Jeanette Schuler and Crystal Hill. Lisa Hornung and Kathy Arne. Shirley Pridmore and Louise Schulte recall their time at Dr. Gustin's studio. 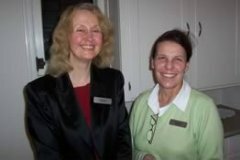 Sheryl McKee and Carmen Bassingthwaite, volunteer hosts at the reception.